How to balance the risks and rewards of emerging technologies is a key underlying theme of the just-released World Economic Forum (WEF) 2015 Global Risks Report. The rapid pace of innovation in emerging technologies, from synthetic biology to artificial intelligence has far-reaching societal, economic and ethical implications, the report says. Developing regulatory environments that can adapt to safeguard their rapid development and allow their benefits to be reaped, while also preventing their misuse and any unforeseen negative consequences is a critical challenge for leaders. The growing complexity of new technologies, combined with a lack of scientific knowledge about their future evolution and often a lack of transparency, makes them harder for both individuals and regulatory bodies to understand. But the current regulatory framework is insufficient, the WEF says. While regulations are comprehensive in some specific areas, they are weak or non-existent in others. It gives the example of two kinds of self-flying aeroplane: the use of autopilot on commercial aeroplanes has long been tightly regulated, whereas no satisfactory national and international policies have yet been defined for the use of drones. 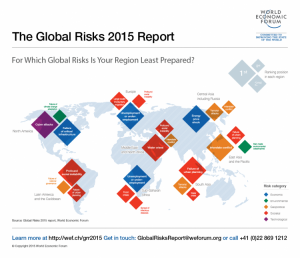 Geopolitical and societal risks dominate the 2015 report. Interstate conflict with regional consequences is viewed as the number one global risk in terms of likelihood, with water crisis ranking highest in terms of impact. The report was developed with the support of Marsh & McLennan Companies and Zurich Insurance Group and with the collaboration of its academic advises: the Oxford Martin School (University of Oxford), the National University of Singapore, the Wharton Risk Management and Decision Processes Center (University of Pennsylvania), and the Advisory Board of the Global Risks 2015 report.